Here is an interview on the Nelo Summer Challenge website. Click on the photo below to find out all about the first ever World Surf Ski Champs happening in July this year. When and how did you started surfskiing?I started back in my school days as part of the life saving movement here in SA. As you move up from the Junior (Nipper) to Senior you need to be able to paddle a surf ski to be able to take part in the Ironwoman event. Canoeing was a also a school sport, so I did that in the winter. Has your season already started? How’s it going so far? I took a break after the 50km cape Point Challenge in December, and have started training again. No races this year yet, just trying to build some base fitness. You’ve won the all the Summer Challenges you’ve entered. Do you feel it’s lucky charm event for you? Lucky charm? Ha-ha, I believe you create your own “luck”, but yes, I think momentum is important, and I have always had so much fun when I come to Porto, so I am always in a good head space. I love the event, and the venue, so I can’t wait to race there again. 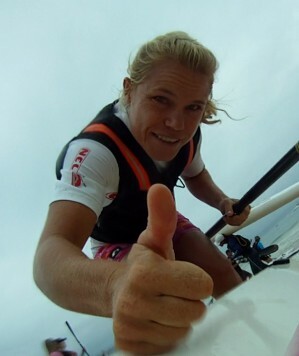 As a South African and being RZA a major surfski center, do you think that Portugal (and the Nelo Summer Challenge) was a good choice for hosting the 1st World Championships? I think Portugal is the perfect place for the 1st ever World Champs! It has great downwind conditions, is easily accessible by most countries, and the event has a great tradition of awesome organisation, so I think you guys will set the bar nice and high for the rest of the world, for future World Championships events.